Reduces shedding up to 90%. Stainless steel deShedding edge reaches deep beneath your dog's long topcoat to gently remove undercoat and loose hair. Used and recommended by veterinarians and professional groomers. 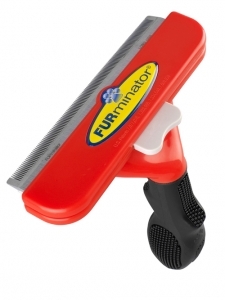 FURejector® button cleans and removes loose hair from the tool with ease. Guaranteed to reduce shedding better than any brush, rake or comb. Designed by a groomer for professional results.